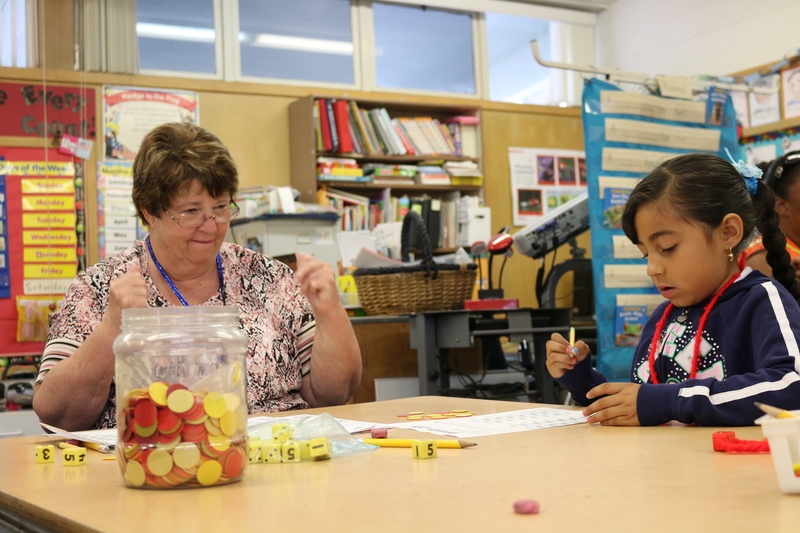 Kindergarten Teacher Joyce Leas works with her young students on a counting game during a recent Game Day at Park View Elementary School. 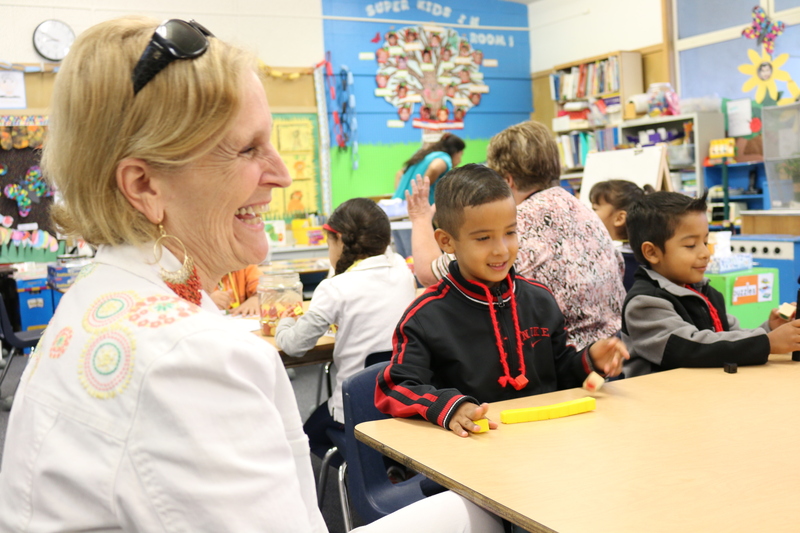 It’s the end of the school year at Park View Elementary School in Simi Valley and the school’s two kindergarten classes have come together for a morning of fun. In a busy, color-filled room, one group of students plays a dice game with partners, while another works on counting games and still another practices math through playing cards. And the group along the room’s side wall? They are at the computer stations where the children play learning games. 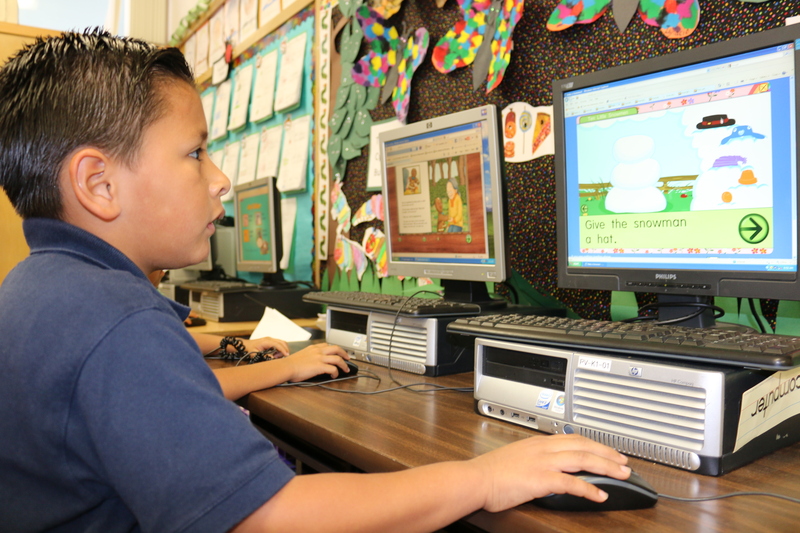 The computer games are a favorite activity among the students. 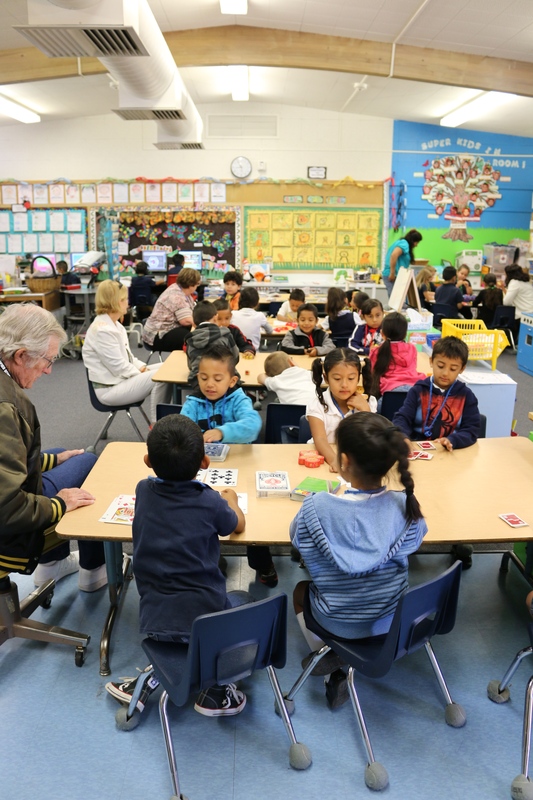 It’s Game Day and the 27 kindergarteners of Joyce Leas and Teri Smyres’ classes don’t seem to notice, or mind, the educational value embedded in each of the games they play. 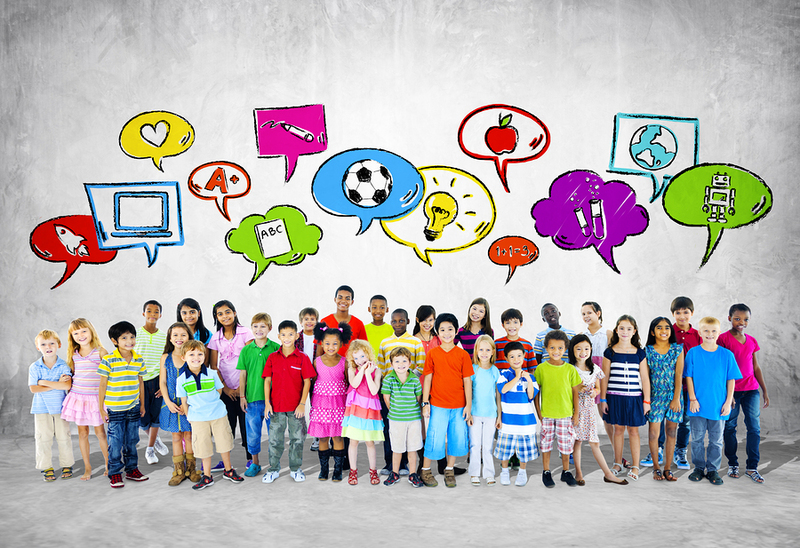 Instead, they interact with each other while their teachers, and the three room volunteers, encourage them to work together to find the answers. And the grown-ups never seem to stop encouraging their young charges. With three volunteers in the class, the students receive a lot of guidance and attention. 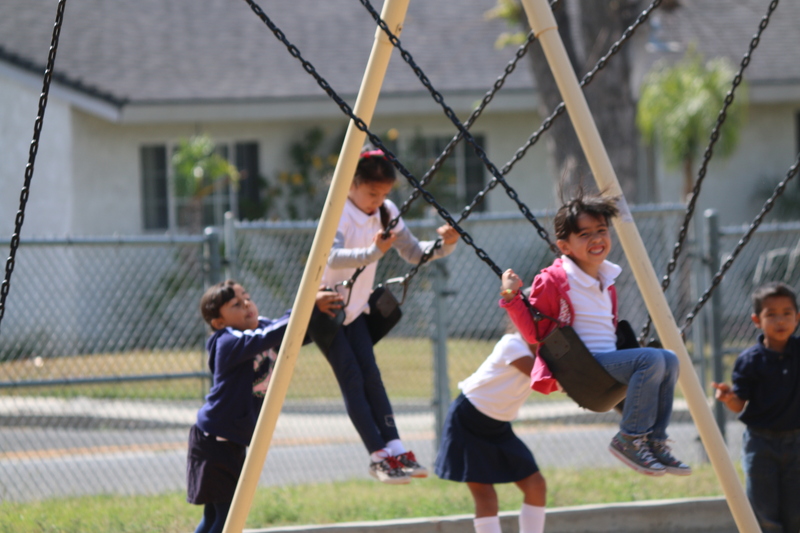 When you visit Park View’s campus, the first thing noticed is that the children wear uniforms. White and navy polo shirts and navy bottoms dominate the landscape. It’s the only school in the Simi Valley Unified School District that requires its students to wear uniforms, a change instituted under Principal Anthony Karch two years ago. “The idea came partly from a parent, who is also a teacher here, who previously worked at a district with uniforms. It also came from a sense that our students needed to get a little more serious about the business of school,” Principal Karch said. Park View is a Title I school, which is a Federal designation identifying a school with a high percentage of students coming from low-income families. Because poverty can be a barrier to a child’s education, the school receives extra funding for its students, which translates into added services and resources to help the children learn and succeed. Principal Karch said that in the first year of the uniform policy, which 90 percent of the parents voted to implement, there were no significant changes in attendance or discipline issues fielded by the Principal Karch. But this year, the changes have been dramatic, and Principal Karch said he believes that uniforms are a big part of the improvements. “Two years ago, we had 85 incidents of students coming to see me for discipline issues. This year we dropped to 55. That’s a 35 percent drop. And this year, our attendance has been phenomenal! We’re number 6 out of 21 elementary schools for good attendance,” he said. Park View also has a deep connection with the arts. Students in grades 1 to 6 who are at grade level or above in their school work can become part of the drama program. Two plays are produced annually by the students. Kindergarteners take dance classes and all of the students enjoy the school’s art program, Artist in the Classroom, where working artists come and work with the kids. Kindergarten Teacher Teri Smyres gets very excited when her student figures out the answers. With almost 300 students, Park View is a smaller school compared to others in the district. Principal Karch said most of those attending, about 70 percent, come from the surrounding neighborhood. But there is room for more students, especially in kindergarten, which is an all-day program. 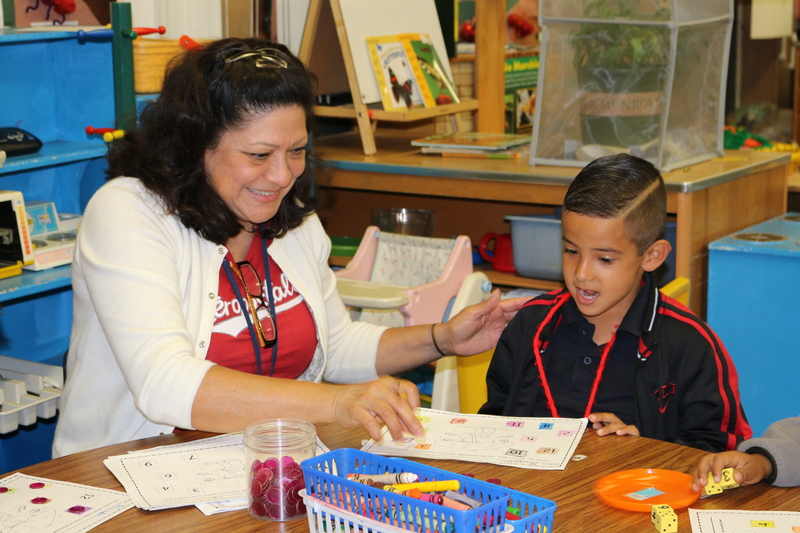 While there are more students already enrolled in kindergarten for next year, Principal Karch hopes to bring in even more. Applications are still being accepted for kindergarten and you don’t have to live in Park View’s neighborhood to attend. Classes will end on Friday, but the school’s office will remain open until June 26. For more information, call the school at 805-520-6755 or stop by the campus at 1500 Alexander Street. All of the students at Park View wear uniforms. 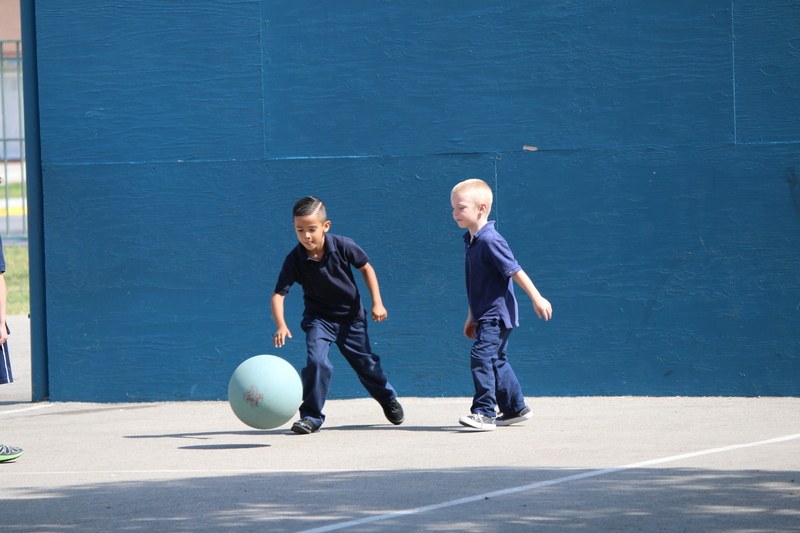 Kindergarteners enjoy separate recesses from the school’s other grades.